What sort of curious place would give its shortest street the longest name? Or build a dazzling gold-lined dome – and hide it from view? The same mixed-up metropolis that was once the capital of England – and also birthplace of its most infamous terrorist… Even if you were the world's most imaginative storyteller, you couldn't make York up. The city is stranger than any fiction. But to find its oddities and secrets you'll need to step off the beaten tourist path and explore its footstreets and alleys, known locally as snickelways. Be warned, the journey might throw up a few dark moments, from the Bitchdaughter Tower to the spikes upon which traitors' heads were impaled. Yet you'll also encounter the traces of many local colourful characters, from an Oscar-winning actor to a dastardly plotter, from assorted stone cats to a rather rude ghost. You can browse the shops in the street that inspired Harry Potter's Diagon Alley and tour remarkable retailers like Duttons For Buttons and the Banana Warehouse, which sells pretty much everything – except bananas; or celebrate in the city that hosted Britain's first Christmas and is home to Ulph's Drinking Horn. With 2,000 years of history to discover, there is a surprise around every corner – if you know where to look… Welcher kuriose Ort gab der kürzesten Straße den längsten Namen? Wo feierte man das erste Weihnachtsfest Englands? Und wieso kann man im Banana Warehouse (fast) alles kaufen – nur keine Bananen? York ist seltsamer als jede Geschichte, die man sich ausdenken kann. Wenn Sie seine Kuriositäten und Geheimnisse entdecken wollen, müssen Sie sich abseits der Touristenpfade bewegen. Aber Achtung: Die Reise könnte ein wenig schaurig werden! Besuchen Sie den Bitchdaughter Turm. Oder die fähle, auf die die Köpfe von Verrätern gespießt wurden. Finden Sie die Spuren der vielen lokalen und schrägen Charaktere – vom Oscar-Preisträger über eine Reihe von Steinkatzen bis hin zu einem ziemlich ruppigen Gespenst. 45_GR8escape York | Can you get out in under an hour? 48_Guy Fawkes Inn | Birthplace of Britain’s most infamous terrorist? 76_Napoleon at the Hall | Why is he living with the Merchant Adventurers? 82_Purpleman | Who is the man in mauve? 91_Snickelways | Dare you explore York’s dark and narrow passages? 96_Stone Cats | They climb across York – can you find them all? This vision of York remains stubbornly popular – but it’s as narrow as the city’s slenderest snickelway. There is history here of course, centuries of the stuff. John Kirk’s Victorian street still delights, nearly 80 years after it first opened in the Castle Museum. Yet dig a little deeper and you can find livelier, edgier, more bizarre tales of bygone times, from York’s version of the Hell-Fire Club to the Cold War bunker built to save the chosen few from nuclear annihilation. Meanwhile York is shaking off its “living museum” label and is busy building a future to live up to its past. That can be seen everywhere from the glassy modernist Hiscox HQ to the experimental art and music in the Basement Bar. Old haunts are being repurposed: a cafe above York’s only remaining barbican, a cinema in a pub, a library created inside a park-keeper’s lodge. Millions of pounds have been invested in buzzy new places to eat and drink. Amid all this, the essential eccentricity of this overgrown town remains intact. It is the sort of place where people have no qualms in opening the world’s smallest Lego shop, or welding a van to a tugboat to create a floating ice cream parlour. Who wouldn’t want to visit a shop that sells only cheese, or another named after a Bob Dylan lyric? 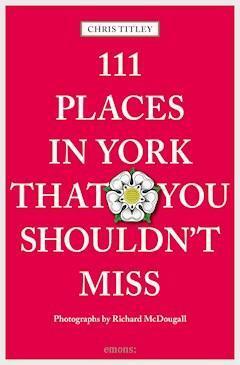 This guide is not about York’s most famous landmarks but its quirky corners, and most important, its people, past and present. It has been a pleasure and an education seeking them out. York has one modern multiplex – and another in the pipeline. But sometimes you want to see a movie in more convivial surroundings than an out-of-town warehouse, and enjoy refreshments more appetising than a bucket of popcorn. That’s where Thirteen Thirty One comes in. Situated on narrow, cobbled Grape Lane, it is primarily a bar and restaurant. With its secret beer garden – a great place to chill on a balmy summer night – and varied eating and drinking spots on different levels, it offers options for both the people-watchers and the tryst-hatchers. But unlike any other bar in York, it also comes with its own cinema. The man who founded Thirteen Thirty One, Sam Robinson, is a cinephile. He dreamed of making movies since he was a boy – and that dream came true when he co-produced Whoops!, a horror-comedy about a woman who becomes a serial killer by mistake. Named by the head of the Raindance Film Festival as her “favourite British film of the last decade” the York-made movie became a cult hit. And, naturally enough, it has been screened at Thirteen Thirty One. Address 13 Grape Lane, York YO1 7HU, +44 (0)1904 661130, www.1331-york.co.uk, info13@1331-york.co.uk | Public Transport 7-minute walk from Bootham Row car park; 3-minute walk from York Minster. Closest bus stop: St Leonard’s Place | Hours Bar: 8am–1am; Restaurant: Mon–Fri 5pm–10pm, Sat & Sun 11am–10pm| Tip If you want to eat elsewhere and just come for the drinks and screenings, try York’s top vegan restaurant, El Piano, next door. Brandy Brown’s Cinema is found in the attic of the bar. Boasting 18 fully reclining leather armchairs, and a number of beanbags at the front for latecomers, it is a place to watch movies in unique comfort. And instead of that tub of popcorn, there is a movie menu including sausages and mash and beer-battered fish goujons. Thirteen Thirty One is one of the favourite locations of the Aesthetica Short Film Festival, which brings about 300 mini-movies from around the world to various city venues every November. Master filmmakers give talks and workshops, and the festival is now held in such esteem that every movie screened is eligible to enter the BAFTA, British Short Film and Animation Awards. However, if you want Brandy Brown’s cinema to yourself, you can hire it out, with a free glass of bubbly thrown in for each viewer. It began life as the ArtSpace. But that was too abstract a name for such an interesting and personal take on the art world. In 2010, the gallery was renamed According to McGee, which reflects the unique perspective of its owners, former secondary-school teachers Greg and Ails McGee. Since then, the gallery and the McGees have flourished. They have showcased contemporary art in all its forms, championed artists from close to home and across the world, and been active participants in shaping a cultural shift which is moving York from conservative to cutting edge. Found opposite Clifford’s Tower, the remains of a castle from William the Conqueror’s time, this modernist gallery could not offer more of a contrast. There’s always something new and interesting to see. Address 8 Tower St, York YO1 9SA, +44 (0)1904 671709, info@accordingtomcgee.com, www.accordingtomcgee.com | Public Transport 2-minute walk from Castle car park. Closest bus stop: Tower Street | Hours Mon–Fri 11am–5pm, Sat 10am–5pm| Tip Art lovers will also enjoy a trip to Chris Ceaser Photography (89 Micklegate), where Chris showcases his stunning landscape photos in the gallery. That was soon followed by the creation and display of a series of posters prompted by a city Twitterstorm. UNESCO awarded York “City of Media Arts” status in 2014, and while Greg McGee is a supporter, the decision provoked as much scepticism as celebration on Twitter. So Tweets reflecting all shades of opinion were turned into graphic posters and displayed at the gallery: fleeting social-media moments, captured and made collectible. Described by Glamour magazine as “an exciting independent white cube gallery,” According to McGee is always worth a visit. And that’s according to artists from far and near. Acomb won’t win awards for being the prettiest corner of York – but then that’s a big ask. It is, however, one of the city’s liveliest communities, with a fierce sense of independence. Travel along Front Street and Acomb Green and you get a sense of the village that once was. There’s even an old stone cattle trough, although a cow hasn’t been near it for a generation or two. Acomb is now officially a township – more of a full-fledged town, in reality – with a shopping centre featuring many family-run stores alongside the multiples. Some city centre residents head there to shop, feeling it offers better bargains than the stores on expensive streets like Stonegate and Coney Street. Address Front Street, Acomb, York YO24 | Public Transport Closest bus stop: Front Street | Tip West Bank Park, on the Acomb/Holgate border, is an oasis from the bustle. And you can make a day of it, with lunch at the cafe Tea on the Green and an evening beer or two at the Sun Inn, which offers sports bars, quiet rooms, and benches overlooking the green, depending on your mood and the time of year. As the rail industry, which supported Acomb’s growth, declined, residents have grumbled that the township hasn’t enjoyed the investment it deserves. But now a new breed of energized community activists has grabbed the scruff of this suburb’s neck and is moving it forward. In 2013, the first ADAM (Acomb Dance Arts & Music) Festival was launched. And it’s grown each year since. There have been pop-up art galleries and the creation of Acomb Alive, a campaign to promote local businesses. Acomb Green, with its impressive children’s playground, is only one of the open spaces worth exploring. In 2007, York awarded nature reserve status to Acomb Wood and Meadow, home to great spotted woodpeckers and tawny owls. And a group of local enthusiasts is now converting a former weed-riven wasteland behind the Methodist church into a community garden. Here’s one of those odd curiosities that you never tire of discovering in York. Head to All Saints Church – not on Pavement, but the one on North Street. Seek out the Orders Of Angels window and study it carefully. Can you spot him? One of the figures depicted in 14th-century stained glass is a chap sporting a fine pair of spectacles. True, they’re quite clunky and made of metal, and are clearly not designer frames. But come on – how many medieval fellows sporting specs do you see? The answer is very few: this myopic Middle Ager is one of the earliest depictions of eyewear. Address All Saints Church, North Street, York, YO1 6JD, +44 (0)1904 706047, www.allsaints-northstreet.org.uk | Public Transport 2-minute walk from Tanner Row car park. Closest bus stop: Micklegate | Hours Winter, Mon–Sat 10am–3pm; Summer, 10am–6pm| Tip Almost next door to All Saints is the Whippet Inn, a contemporary steakhouse and bar which has earned many rave reviews. Now that you’ve found him, enjoy exploring the rest of the church, beginning with the other windows. All Saints’ medieval stained-glass collection is among the most important in Britain. The most remarkable is the Pricke Of Conscience window. This is the end of the world, depicted in glass. It is based on a medieval poem about the final 15 days of the Earth, with each day given its own panel. Tsunamis, earthquakes, and infernos rage, stars fall from the sky, men cower, and the dead rise from the grave. If you’re having a bad day, a visit to this window puts your woes in perspective. Originally dating from the 11th century, the church in its present form – with tower, octagon, and 120-foot spire – took shape at the end of the 1300s. In the 1420s Dame Emma Raughton, an anchorite or hermit, lived in a two-storey dwelling attached to the aisle. She received visions of the Virgin Mary. Brother Walter came to live in a room on precisely that spot after the First World War; he was even interviewed for one of Alan Whicker’s BBC documentaries. From the hexagonal wooden pulpit to the angels holding musical instruments that adorn the chancel ceiling, All Saints contains stories wherever you look. Just remember to bring your spectacles. The plaque is missed by most people dashing down Colliergate. But it marks a world first: this is the spot where, in 1768, the Ancient Society of York Florists held their first meeting. And they’ve not stopped since. That means the group holds not one but two world records. It is the oldest horticultural society on the planet – and organises the world’s longest-running horticultural show. The founders first met in what was the Sandhill public house on Colliergate on April 20, 1768 – a time when a florist was someone who grew flowers for their beauty, rather than sold cut blooms as a business. That year’s inaugural show featured only six florists. Address Colliergate, York, YO1 8BW, +44 (0)1904 704829, www.ancientsocietyofyorkflorists.co.uk, info@ancientsocietyofyorkflorists.co.uk | Public Transport Closest bus stop: Stonebow | Tip Just across St Andrewgate, on the same side of Colliergate, you can enjoy coffee from the award-winning baristas at Harlequins. Times changed. Showstopping blooms such as chrysanthemums and dahlias arrived in Britain, and gardening became a more universal pastime. York’s ordinary workers took to the city’s allotments dreaming of a prestigious medal at the Ancient Society of York Florists show. Today the institution is still going – and growing – strong. It hosts four events a year, in the sports hall of York’s agricultural college, Askham Bryan. Tulips and daffodils feature heavily in the spring show, while fuchsias, roses, and sweet peas have their own sections come summer. Chrysanthemums are still highlighted in the two autumn shows, and there are even prizes for baking and art. The Colliergate plaque now sits above the doorway to Barnitts, a department store which includes a gardening section stocked with everything you need to grow prize-winning flowers of your own.